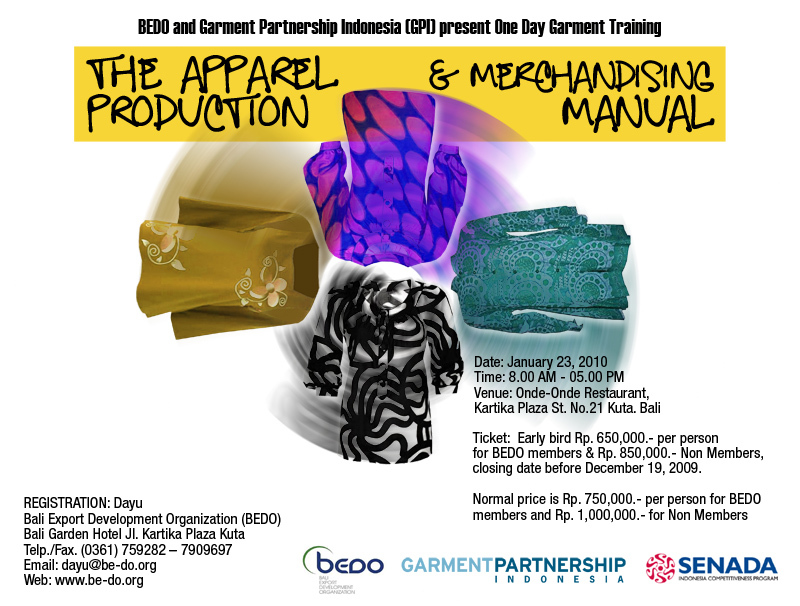 Since BEDO and Garment Partnership Indonesia (GPI) have partnership to corporate sharing information and organizing a training to help SME’s in Bali. We have program with the objective of The Apparel Production and Merchandising Manual to provide Indonesian garment manufacturer with the latest procedures, methods and practical tools to improve their production & merchandising capabilities toward international market. GPI is a private sector initiative facilitated by SENADA that brings garment industry stakeholders together for collaborative efforts in areas or mutual concern. SENADA is a four-year, USAID-financed project whose goal is to enhance Indonesian competitiveness. GPI is working with the Garment Training Center to maximize the value of SENADA’s assistance in order to best develop Indonesia’s garment industry. Ticket : Early bird Rp. 650,000.- per person for BEDO members & Rp. 850,000.- for Non Members, closing date before December 19, 2009. – How to interpret a tech pack and design concept. – Sourcing base on specification vs design trend. Hope above can explain well the material content and we look forward to hearing your soonest confirmation.